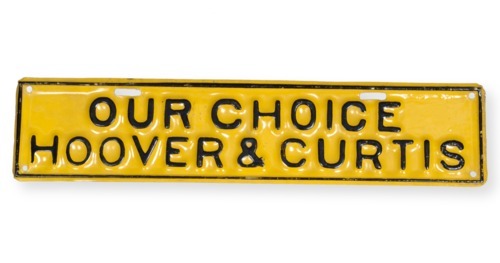 Yellow and black vehicle tag promoting the 1928 presidential campaign of Herbert Hoover and Charles Curtis. The tag was a souvenir of the Republican National Convention held in Kansas City, Missouri, where Hoover and Curtis were selected as the party's presidential and vice presidential nominees. Born in Topeka, Kansas, Curtis served in the United States Congress and was later elected to Vice President. He was the first individual of American Indian ancestry to reach that high office. The tag was made by inmates at the Kansas State Industrial Reformatory in Hutchinson, Kansas.